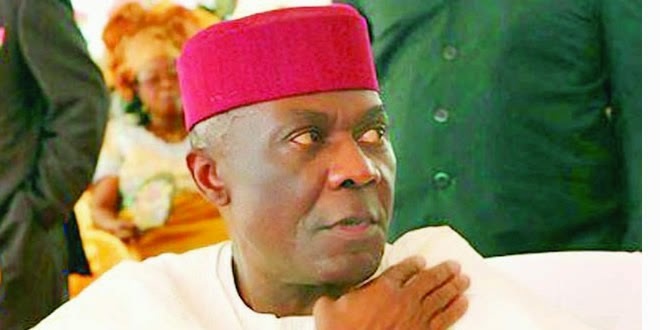 Veteran politician and elder-statesman, Senator Arthur Nzeribe, has vowed to resist the re-election of the governor of Imo State, Rochas Okorocha in 2015. His words: “On May 29, 2015, Douglas House in Imo State will play host to a baggage-free brand new governor. The fresh governor will emerge from one of the two distinct groups in Imo politics, made up of 15 candidates. The veteran politician, who has been out of the nation’s political space since his exit from the Senate in 2007, equally vowed that he would influence the emergence of the next governor of Imo State in 2015. He said: “Here in Imo State, critics may want to know why Nzeribe has taken it upon himself to pontificate on who should govern the state in 2015. Should this question arise, it will be an interesting poser. “In the last three governorship elections in Imo, I looked the other way when the governors were being installed by outsiders. In this very project of seeing that decent and straightforward politicians take over the mantle of leadership in Imo State, I will never look away again. Nzeribe also identified politicians, who would not rule Imo State in 2015. “In fact, we do not want those that will run our economy down to file out either as pretenders or as contenders to the governorship seat in the state in 2015. “Those whose agendas are to buy and fuel private jets, build intimidating estates in choice places at the expense of the state will not get near Douglas House. Also, those who purchased and owned private banks in tax haven countries abroad will not be allowed to govern Imo State come 2015. “The dubious politicians maintaining fat foreign accounts in different ‎hard currencies will not come near Douglas House in 2015,” he affirmed. He revealed that consultations among stakeholders in the state have reached advanced stages, adding that they would not sit back and watch the state looted. “Money will not be an issue for stakeholders in the project of purging Douglas House of looters. Already, the stakeholders have come together and consultations are continuing. Purging Imo State Government ‎House of treasury looters is a task that must be done. Imo State is no longer for sale,” he added.